VĨNH PHÚC — Various rivers in the northern province of Vĩnh Phúc are getting polluted by waste water used by households for daily chores and from trade villages. A typical case is the Phan River. Phan River passes through 24 communes in Tam Đảo, Tam Dương, Vĩnh Tường, Vĩnh Yên and Bình Xuyên districts. The river plays great importance in regulating water sources and maintaining the environment in the province. The river also supplies water to the Cà Lồ and Cầu rivers. Earlier, the Phan River was wide with clean water, so residents could catch different kinds of shrimps and fish, in addition to being an important waterway transport route. 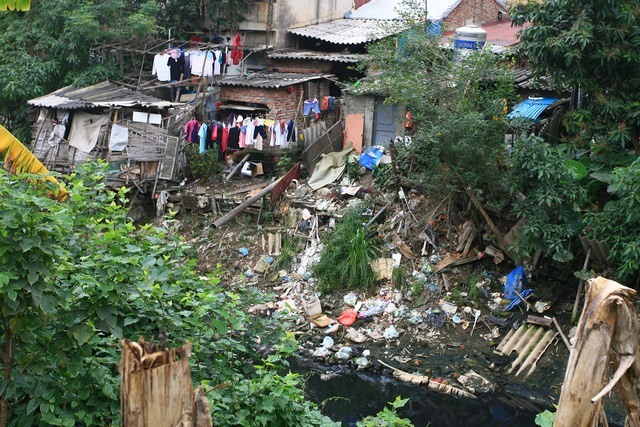 During the urbanisation period, locals residing along the river discharged a large quantity of waste into the river and encroached upon the riverbed to build houses and for other purposes, due to which the river became seriously polluted. Reports by the provincial authorities revealed that every day, nearly 20,000cu.m. of waste water from more than 210,000 households, 4,000cu.m of untreated waste water from industrial zones, more than 21,000cu.m of waste of millions of livestock and poultry and hundreds of tonnes of rubbish are discharged directly into the Phan River. In Yên Lạc District alone, hundreds of households engaged in jobs related to metals, nonmetals, paint, rubber and chemicals. Their waste also affected the water’s quality. Phó Đáy River’s pollution recently attracted people’s concerns, who realised the river was becoming more and more polluted because trade activities along the river were increasing. Bùi Như Ý, deputy director of the provincial Department of Agriculture and Rural Development, said until the end of last month, hundreds of bags containing dead pigs were thrown into the Phó Đáy River. Local authorities said the dead pigs were from the upper reaches and followed the water’s flow to reach Vĩnh Phúc. The bodies of the pigs had a foul smell, causing pollution on a large scale and leading to the risk of disease for locals and animals. To improve the situation, Vĩnh Phúc Province has invested VNĐ32 billion (US$1.4 million) since 2008 to reduce pollution in 15 communes. The province will implement a plan for land use in the Phan River area and prepare data to ensure environment management in the area.